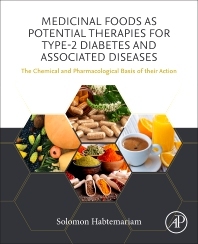 Medicinal Foods as Potential Therapies for Type-2 Diabetes: The Chemical and Pharmacological Basis of Their Action is the first book to focus on active pharmacological principles that modulate diabetes, associated risk factors, and complications and the mechanism of action of widely used anti-diabetic herbal plants, rather than the nutritional composition of the foods. It provides up-to-date information on the scientific basis of some acclaimed antidiabetic super fruits, species, and other food ingredients. The global incidence of diabetes and its major risk factor, obesity, is growing with epidemic proportion, and so there is growing interest in finding new drugs from natural and synthetic sources to help halt this epidemic. The book is divided into six sections: the first part addresses fact and figures of diabetes and obesity at global level. In the second part, the physiological control of carbohydrate and lipid metabolism as well as some common therapeutic targets is presented. In Section 3, the pathophysiology of type-2 diabetes and therapeutic options are presented. A dedicated section on super fruits includes the therapeutic potential of bilberry and blueberries, bitter melon, okra, prickly pear cactus, and other fruits that gain importance as antidiabetic agents in recent years. In Section 5, the chemistry and pharmacology of spices including cinnamon, cloves, fenugreek, garlic, ginger, and turmeric is presented to outline their antidiabetic potential. The last section includes beverages such as tea, coffee, and yerba mate as well as a dedicated chapter on food supplements and other food products with emerging antidiabetic potential. Medicinal Foods as Potential Therapies for Type-2 Diabetes is invaluable for research scientists and students in medical and pharmaceutical sciences, medicinal chemistry, herbal medicine, drug discovery/development, nutrition science as well as herbal practitioners, industries from the nutraceutical and pharmaceutical areas, and organizations dealing with diabetes and obesity managements.